Many years ago I fitted a pair of Spanish barrels onto an action. The job took months of painstakingly slow work with files and emery paper and it taught me respect for barrel fitters. The major difficulty in fitting new barrels to an existing action is the simultaneous fitting of several surfaces. The hook, rear of the front lump, front and rear of the rear lump, the breech ends and radius, all these are smoked and checked repeatedly for contact and each is filed to ease the whole barrel assembly into the action recesses. A mistake in any of these surfaces can ruin the barrels. The original attempt after months of filing and smoking in the lumps. Years after that first attempt I had to fit a set of 3D made plastic barrels onto a prototype, also 3D made, action. There was no way I would resort to the simultaneous fitting of multiple surfaces, so the job was broken into a linear process. 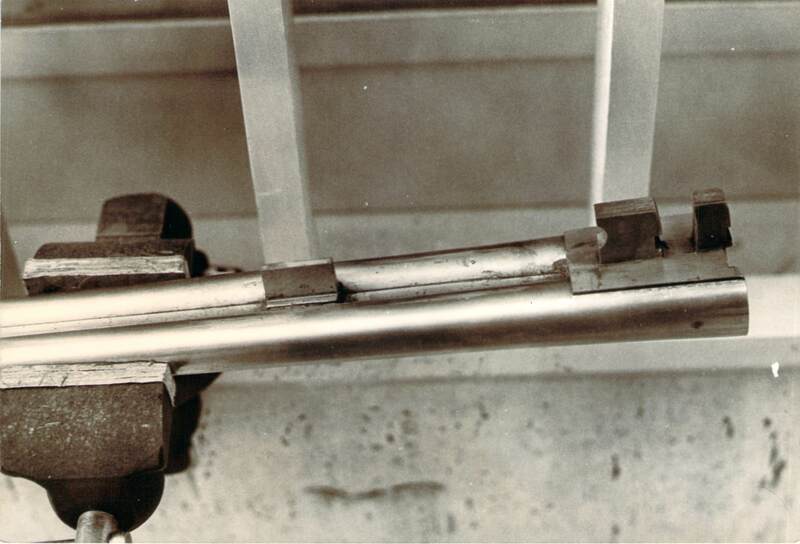 Additionally, interchangeable contact surfaces were contrived so that a mistake in one surface would ruin only the replaceable contact point and not the whole barrels assembly. And this because though 3D parts are made of plastic, the cost of printing them is considerable. 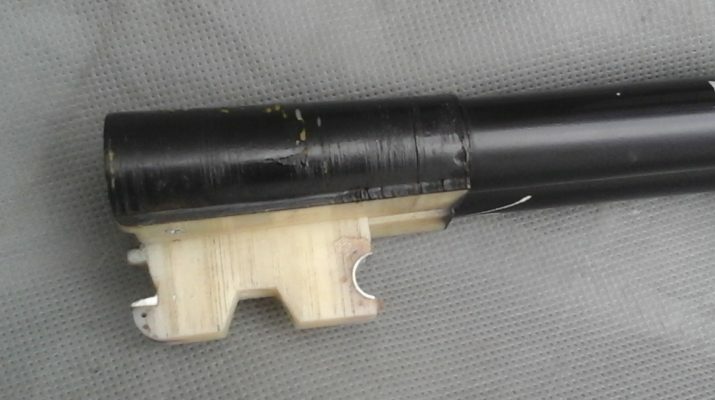 The opening photo is of the prototype set of barrels. The «shoes» at the hook and the rear bite are easily seen, they are in metal. The idea was to make replaceable «shoes» for the hook and the rear lump bite. The design was modified so as to leave room for these «shoes» to be fitted and filed to fit the corresponding parts of the action, the cross pin (hinge pin) and the locking bolt. With these removable «shoes» the process could then be made linear. First the hook was fitted to the cross pin. The first attempt did not go so well so a second «shoe» was fitted to the barrel hook and eventually the fit was accomplished. 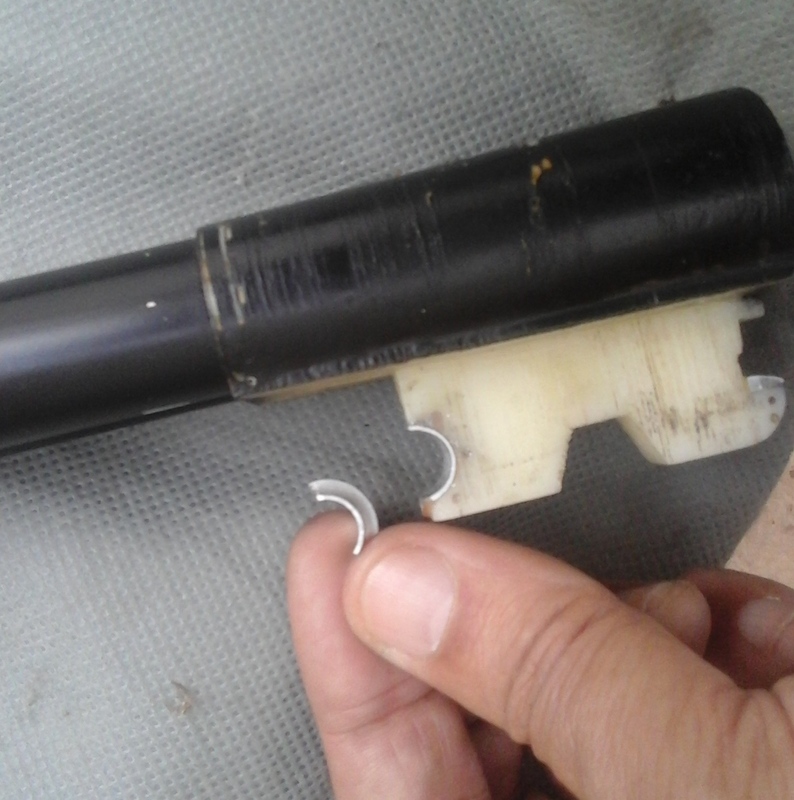 Second step was the fitting of the breech ends to the standing breech and that went OK. With the hook already fitted, and without hindrance from other surfaces, this second part of the fitting was made easier. In the traditional way I would have had to smoke in the lumps along with the breech ends. Having only the breech ends to fit was… liberating! Step number three was to fit the «shoe» to the rear lump and smoke it in so that the locking bolt snapped and kept the barrels locked into the action. Again, the linearity of the process meant that as the hook and breech ends were fitted and checked out, I could focus on the bite and nothing else. The design did not call for fitting on the circle, where the front face of the rear lump fits against the central action bridge. However, if there was such a need it would be a simple job to make a replaceable «shoe», pin it into a recess on the lump and smoke in the parts. While working on the prototype it was obvious that using cheap replaceable «shoes» at each contact point made the whole job easier and safer. Gone was the fear that a a wrong file stroke would scrap the barrels. Breaking the process down to a linear set of individual fitting steps eliminated anxiety and dramatically reduced the time it took me to fit the barels. Whereas the first job had taken months, the second one took hours. The change was that dramatic. The replaceable «shoe» for the hook. It was turned on a lathe in a few minutes from 20mm bar stock and cut in half to provide two «shoes». The idea of replaceable contact point is not new. Parker shotguns have replacable bite «shoes». Reportedly the Winchester model 21 employs replaceable contact surfaces at the cross pin. Some high end Russian guns as well as the French Verney Carron S9 and the Blaser F3 have replaceable contact points at the rear lump. The replaceable «shoes» offer the possibility of restoration to «as new» condition when a gun comes off face by fitting slightly oversize «shoes» and refitting the parts. Moreover, such refitting will be a linear, one surface at a time business, so theoretically it should be faster and therefore less costly. Obviously such «shoes» are not fitted to the vast majority of double shotguns. With the exception of those mentioned above and the Beretta SO series, few other designs offer such a renovation facility. Rather than lament what Gough Thomas called mental inertia in the gunmaking world a more useful question is whether such a feature can be incorporated when building new barrels or retightening a loose shotgun. The manufacturing part is simple. Using modern EDM machining thin slots can be cut in the lumps and small diameter holes formed to hold the flanges of the «shoes». The shoes themselves are very easy to make on any lathe and milling machine. They can even be hand formed with files from any suitable steel that can stand friction. No soldering or other heat intensive method is necessary to attach them to the barrels, the cross pinning is enough. The EDM process does not involve heat and does not affect the existing metal finish, nor does it present any risk of tools breaking in the barrels necessitating drill removal etc. When considering the possibility of retrofitting such a system to existing design it seems that the monobloc system, (yet again) is the easiest candidate for such a job. However, the other barrel jointing methods, chopper lump and dovetail lump, can also be fitted with thin slots to receive the flanges of the replaceable «shoes». In the case of chopper lumps some of the brazed surfaces are lost, but so much remains that there would be little risk to the integrity of the joint. Like any other process in the making and repair of traditional doubles, the replaceable «shoe» faces potential prejudice. Enthusiasts who saw the results while impressed with the practicality of the process were sceptical. «Cannot be as good as a good as traditional barrel making and fitting» was an opinion heard more than a few times. May be so, but what about repairs? Is it preferable to spray weld the hook, (the currently accepted way to retighten loose barrels), bring the barrels back and lose the much touted «fit on the circle» of the rear lump, just so there are no «ugly looking pinned bits» on the barrel lumps? For those that like to think themselves as keepers of tradition it is. Others, perhaps more rational thinkers, would do anything to avoid using welds on the barrels. To each his own! The 3D prototype monobloc with replaceable «shoes» on the hook and rear lump bite. The hooks are pinned with small transverse pins 1mm in diameter.